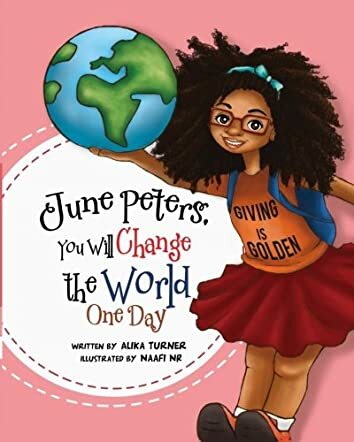 June Peters, You Will Change The World One Day by Alika R Turner is a great storybook for kids with a beautiful message. June Peters, though only ten years old, was a fearless giver and wise beyond her years. June was a responsible girl, much more responsible than her brothers. She had been asking her parents to let her walk to school as it was just a block away. Finally they agreed and gave her a chance to do that for a week. This delightful story with its thought-provoking message will definitely change the behavior of many children, and one need not be an adult to make a difference in someone's life. The author conveys a fine message effortlessly through the story of June. The pictures are colorful and lovely and they give personality to the characters and breathe life into the scenes. The portrayal of June's character is inspirational and will motivate many readers to change in a good way. It's a good bedtime storybook for children and can also be used for read aloud sessions in classrooms and school libraries. The book teaches kindness, caring, sharing, and respecting elders in a mildly assertive manner. Books that have a good message and concept are ideal for kids to help them understand these easily when narrated via a story. This story will teach them how to be kind, share, and care. It also reiterates the fact that it is possible for anyone to make a difference in this world by their actions. An excellent story with a wonderful message for young readers.